Morningside Heights is known as the "Academic Quarter ". It is located on the Upper West Side between Morningside Park and Riverside Park facing the Hudson River and backs up to Harlem. Morningside Heights is also noted for being seen in many films for its picturesque surroundings. It is also home to Grant's Tomb and wonderful architectural fronts. 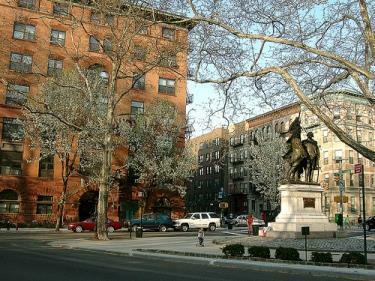 Columbia University in Morningside Heights is a gentle and long lasting neighborhood. Columbia is the 5th oldest college in the United States and the oldest in New York, starting in the year 1754. They are respectful and allow the Morningside community first hand knowledge of what construction, if any, is presumed. History of Morningside Heights - You can almost guess where the name of the neighborhood came from. As with a lot of places around Manhattan it started out as a temporary name and stuck. It was named from a plot of land that was deemed "inconvenient to build upon" in 1867 and was turned into a park. It was named Morning Side Park due to it's location. As with the temporary name of Central Park, residents accepted Morningside Heights as the clear and obvious name of the area between 106th and 123rd Streets. Leaving Midtown Manhattan and the unusually high rents during the turn of the century, not-for-profit educational institutions came to Morningside Heights. In 1904 with the construction of the IRT Subway, apartment buildings sprang up housing workers and teachers alike. During the 1950's some residents began to worry about who was coming to live in the area and Nelson Rockefeller's brother, David, created the Morningside Heights Alliance to be sure all was peaceful and neighborly in the area. As with many neighborhoods in the 1960's race was an issue with some of the buildings being contemplated. Morningside TidBit A slew of famous people have lived and worked in Morningside Heights such as Dustin Hoffman, Lauren Hill, Cecile B. De Mille, George Carlin, George and Ira Gershwin and hundreds more!